The girl was walking near Mossley West Train Station in Newtownabbey when she was set upon by an unknown man, police said. She ran away, but suffered a cut lip and cuts to her knees. 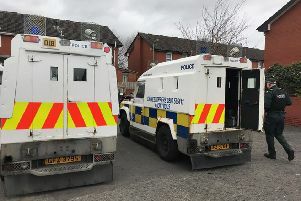 A PSNI spokesman said: "The male is described as being aged in his late 20s, approximately 5ft 10ins tall, of medium build with ginger stubble and bushy eyebrows. "Detective Inspector Kelly is appealing for anyone who witnessed the incident or anyone who witnessed a male matching the description of the attacker in the area of Mossley West Train Station last night to contact detectives in Public Protection Branch in Strandtown police station. "Alternatively, information can be provided to the independent charity Crimestoppers on 0800 555 111 which is anonymous and gives people the power to speak up and stop crime."